This year’s budget process has been overshadowed to a great degree by issues arising from the recent passage of the Tax Cuts and Jobs Act, the most sweeping rewrite of the federal tax code in 31 years. Unfortunately, the Executive Budget barely addresses most of these issues. In some ways, it threatens to add to our competitive challenges—with further tax increases. Among other things, the budget seeks to raise $140 million a year from what is described as a “windfall profit fee” on the federal tax savings of for-profit health insurance companies. This would add to the $5.7 billion in taxes and fees already imposed on health care in New York State. As my Empire Center colleague Bill Hammond has written, the proposal raises fairness issues, since it appears to target “only fully insured health plans, which are sold mainly to individuals and small businesses—the segments most likely to drop coverage over affordability issues.” In fact, in New York’s competitive health insurance marketplace, we could expect insurers to share their tax savings with consumers. Otherwise, as Bill also points out, they could find themselves exceeding their medical loss ratios and owing refunds to policyholders. This proposal isn’t just wrongheaded health policy—it’s also inequitable and counterproductive tax policy, because it would create a precedent for state claw-backs of federal tax savings from any business arbitrarily deemed to have collected a “windfall” from Washington. It would undermine a key purpose of federal corporate tax reform—which is to encourage businesses to increase pay, hire more workers and expand their capital investments. Rather than dwelling further on this or other proposed tax hikes, I would like to use my time to focus on New York’s response to the new federal tax law. To begin with, it’s important to recognize the actual impact on New Yorkers of the new cap on state and local tax deductions, or SALT. Despite the SALT loss, most New Yorkers will now be paying lower federal individual income taxes. That’s because, in addition to curtailing itemized deductions, the new federal tax law reduces income tax rates, nearly doubles the standard deduction, expands child credits, and narrows the scope of the Alternative Minimum Tax. Federal taxes will rise to varying degrees for some types of New York taxpayers, particularly single filers in New York City and relatively affluent, childless couples owning fully paid-off homes in communities with high property taxes. But the biggest losers from the SALT cap will be New York’s highest earners—especially those with incomes topping $1 million a year, who as of 2015 claimed average SALT deductions of more than $500,000, which in turn comprised nearly three-quarters of total itemized deductions for this group. Households with incomes above $1 million are roughly synonymous with New York’s “top 1 percent,” which now generates roughly 40 percent of state PIT revenues. In fact, despite the cut in their top federal rate, millionaire earners in New York City and Yonkers will now face a higher combined marginal effective income tax rate, as shown in Table 1 of the attachment. For top earners in the rest of New York, the “all in” tax rate will barely budge, as shown in Table 2—while comparable taxpayers in most other states will benefit more fully from a federal tax rate cut. 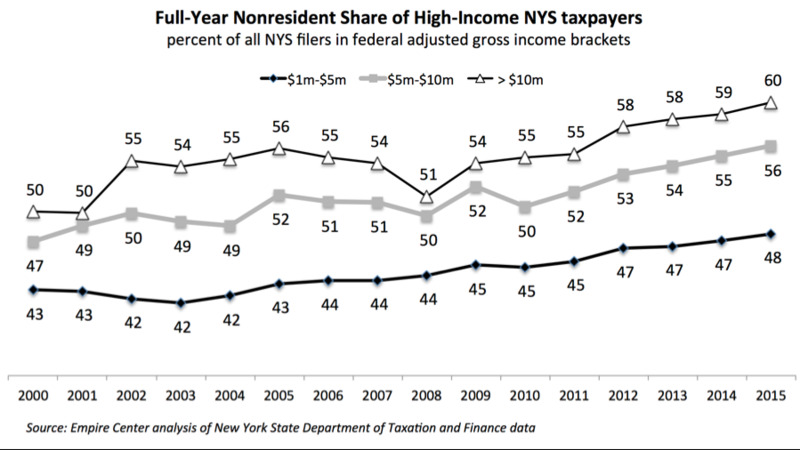 The net tax price of New York—that is, the difference in taxes between New York and states with low or no income taxes—will now rise to its highest level ever, as shown in Figure 1. Those facing the biggest net increase in their net state and local tax burden will thus have a significant added incentive to minimize their exposure to New York State taxes—a situation that should urgently concern the governor and the Legislature, given our heavy reliance on such taxpayers. Even before the federal change, nonresidents were a growing proportion of our wealthiest taxpayers, as shown in Figure 2. On the business side, New York “C” corporations will benefit from reduced federal corporate tax rates, although some of these corporations already had lowered their effective rates by exploiting loopholes the law is now closing. Federal taxes also will be cut by up to 20 percent on business income passed through to owners, investors and partners in unincorporated firms, including Subchapter S corporations and partnerships. However, the impact on pass-through entities is harder to generalize. In fact, the new federal statutory language affecting pass-through entities is so complex and murky that most tax experts have yet to figure them out. In this respect, the federal law remains a messy work in progress. In the meantime, the Legislature’s top priority should be to decouple from federal law wherever necessary to prevent automatic tax increases and preserve the existing personal income tax structure, including state itemized deductions. The Senate has already passed a bill (S.6974A) that would fix this problem—and avoid $1.5 billion in tax hikes—with a blanket stipulation that state statutory references to federal tax law shall mean the Internal Revenue Code and any amendments made prior to Dec. 1, 2017. While the governor failed to address this obvious issue in his initial budget package, the governor’s revenue bill does go out of its way (in Part P) to decouple New York law from a single federal tax provision: the doubling of the federal Child Credit and expansion the income phase-out range for parents claiming the credit. Absent any change, this would automatically double our Empire State Child Credit, from a maximum of $333 to a maximum of $666, and similarly expand the income phase-out range. Legislators might well ask themselves: why should we reject, out of hand, the one federal tax change that would reduce state taxes for New York families? You could keep New York linked to the federal law, further boost the child credit and cover the $500 million cost by eliminating another state tax break that was supposedly intended to help working families but is far less effectively targeted: the sales tax exemption on clothing purchases under $110. New York law already is effectively decoupled from the latest federal changes in another area—the Estate Tax, where our law specifically is tied to the federal estate tax provisions in effect as of 2014. New York’s 2014 Estate Tax reform eliminated the added tax on 90 percent of small estates previously subject to it, including many small business owners and farmers. However, the law created a new problem: punitively high “cliff” rates, exceeding even the old federal rate, on the smallest estates still subject to taxation. New York is now one of only a dozen states still imposing an estate tax. 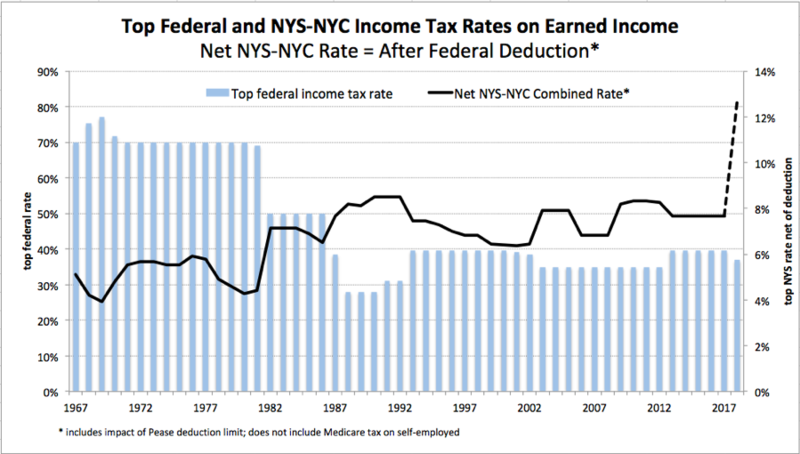 The new federal law, doubling the basic exemption, makes New York more of an outlier. The governor has told us he is exploring ways to “thwart” the SALT cap by shifting from personal income taxes to employer payroll taxes, which would remain deductible as a business expense on federal taxes. However, I believe the tax department’s preliminary report on the issue has made it clear that any broad shift to a payroll tax would be unworkable and undesirable, for a lot of reasons. Don’t rush. Even a narrow restructuring of the tax code is potentially fraught with complications and unintended consequences. Don’t add to the state’s tax burden on any individual or employer. Don’t create new platforms or vehicles that would make it easier to raise taxes in the future. The good news is that, in recent years, the Legislature and Governor Cuomo have taken two very important steps that effectively anticipated the concerns raised by the SALT cap. I’m referring to the local property tax levy cap you passed in 2011 and the multi-year personal income tax cut passed in 2016 and effective beginning this year. Compared to prior trends and historical averages, the tax cap has saved property owners billions of dollars over the past six years—preventing property tax hikes that would have greatly compounded the cost of losing SALT deductions. The scheduled personal income tax cuts will generate savings to further offset the impact of the federal SALT deduction cap on homeowners downstate, where “middle class” often translates into six-figure incomes and five-figure tax bills. Making the tax cap permanent and forging ahead with the personal income tax cuts are essential steps for minimizing the negatives and maximizing the positives of the new federal tax law. For top earners living in New York City, the marginal effective tax rate combining federal, state and local rates will now increase (Table 1). For top earners living outside New York City, the marginal effective tax rate will drop by less than 1%—except in Yonkers, where it will increase slightly (Table 2).